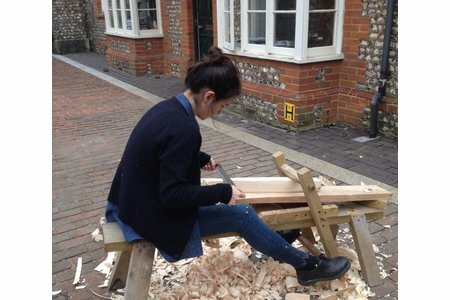 After completing the MA in Conservation Studies at West Dean, I served as an assistant for six weeks in the conservation studio of Michael Parfett in London. Michael works primarily on harps, harpsichords and frames, and the short work placement offered the opportunity to gain experience in conserving musical instruments, decorative surfaces and gilding. 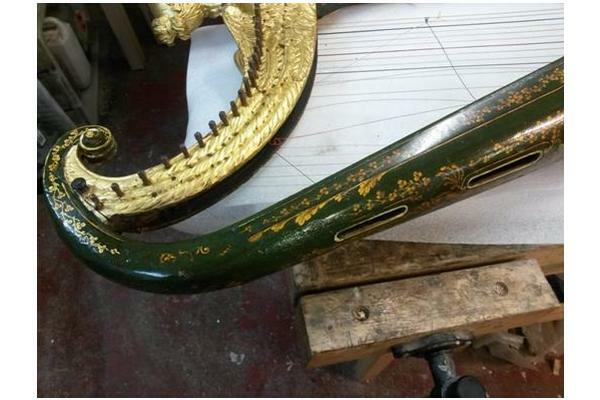 The highlight of my time in the studio was conserving a gilded and japanned harp owned by the Royal Academy of Music. 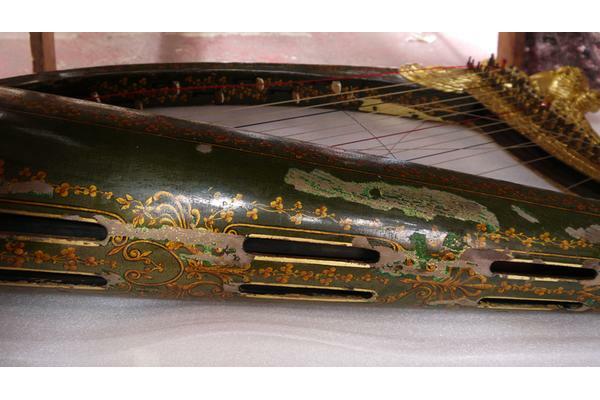 It is known as the "Royal Portable Irish Harp" due to its special connection with King George IV and was made in 1820 by John Egan of Dublin, Ireland. It is also one of a pair known in existence; its twin is catalogued in the book Trois Siècles de Harpes (Rensch 2004). A section of the soundboard during cleaning, bearing the royal warrant of appointment. The japanned surface had numerous losses all over the instrument and in most cases the decoration had been lost down to the bare wood. The task was to figure out the technique of japanning originally used, in order to recreate the lost decoration and reinstate a harmonious overall aesthetic appearance. We did not plan to employ traditional japanning methods to replace the losses, but instead would use modern conservation materials that would result in a seamless blend with the original japanned surfaces and yet allow for future re-treatment of the conserved areas. 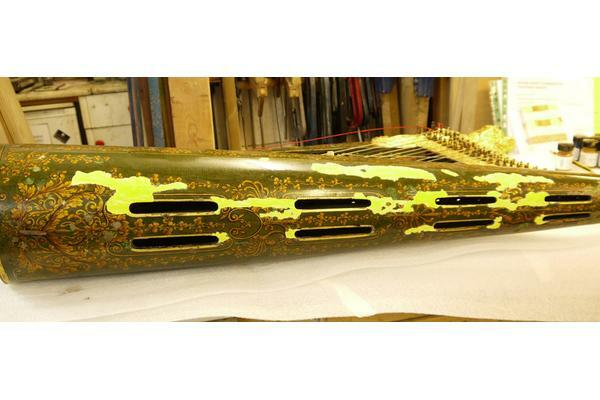 View of the harp’s soundbox showing the multiple areas of loss. The soundbox exhibiting autofluorescence under ultraviolet light. Japanning is basically the fruit of European craftsmen's attempts to imitate the glossy surface of Asian lacquer, which first achieved great popularity in 16th century Europe through imports from the Far East. Lacking the particular trees from which to obtain the sap essential to lacquer production, craftsmen in Europe began experimenting with materials at hand such as shellac, seed-lac, sandarac, and Venice turpentine, among many others, and the resulting furniture and decorative ware are now termed 'japanned' in order to distinguish them from Asian lacquerware. 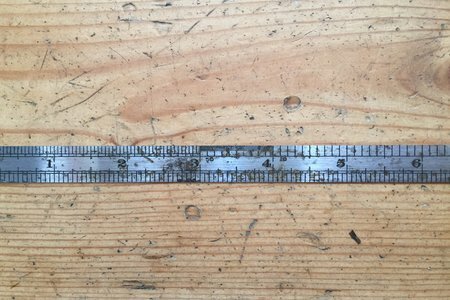 The japanned surface was cleaned and friable areas were consolidated with 5% w/v Paraloid B72 dissolved in Shellsol A100. The consolidation with Paraloid B72 had the additional advantage of functioning as a barrier layer where the edges of original japanning met the new replacement fills. The losses were filled by building up layers of gesso on top of a base coat of jelly size, a process that took up most of the treatment time as up to eight layers of gesso were required before the height of the replacement fills were flush with the original japanning. Further, the gesso could not be allowed to dry completely before the next layer was applied, as this encourages air bubbles to form. The very brief window during which conditions are absolutely right for the application of a subsequent coat of gesso is when the previously applied layer has just turned a matte grey-white. So, when there are as many losses to fill as on this particular harp… you can well imagine that tea breaks were an ill-afforded luxury during this crucial point of treatment. After the last layer of gesso had dried, been sanded and smoothed down with wet cotton swabs, the filled areas were ready to be colour-matched to the green japanning. 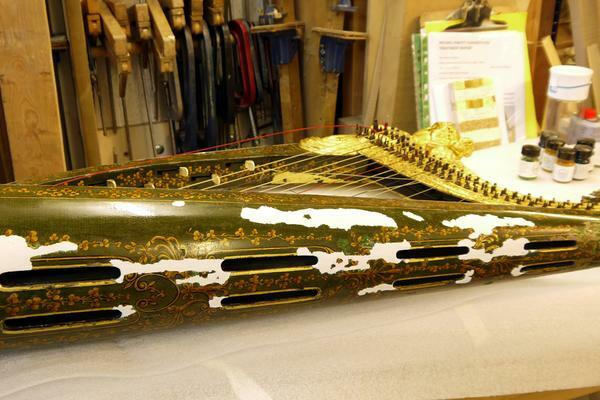 This harp is particularly special as a rare technique of japanning was used on it. Underneath the green japanned layers, a base layer of gold leaf had been applied onto the wood substrate. 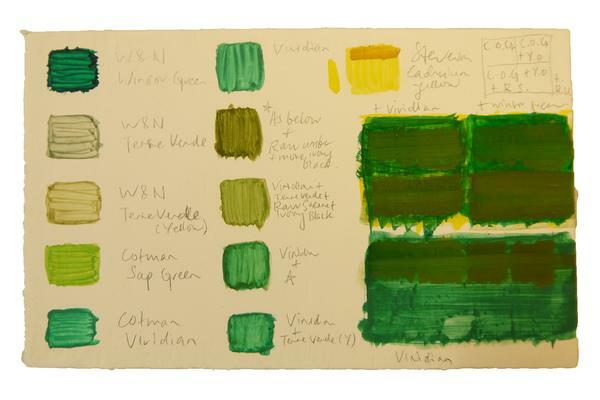 Apparently, this was a particular technique used with green japanning to confer an additional brilliance to the object's appearance (Williams 1913). 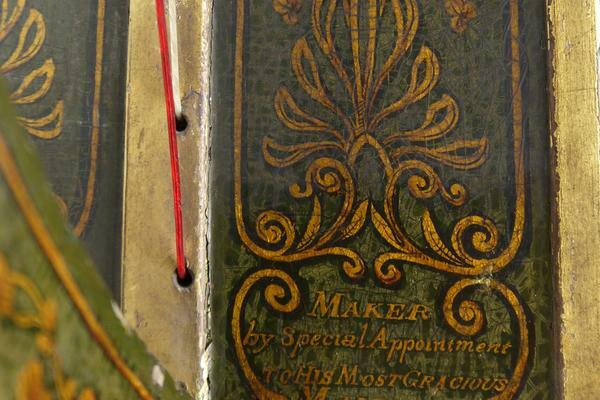 Not many green japanned objects made using gold leaf as a base are known to exist. 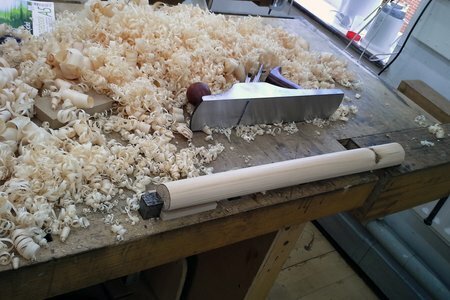 There is one other harp in the collection of the Metropolitan Museum of Art in New York that was created by Egan in 1819 using this technique. Nancy Hurrell, who wrote the initial condition assessment report for the "Royal Portable Irish Harp" and also inspected the Metropolitan Museum's harp, is of the opinion that Egan only used this technique for very special instruments (Hurrell pers. comm. 2016). Colour tests performed on a gessoed wood panel indicated strongly that a yellow base was of the essence in order to recreate the effect lent by the gold leaf. Colour tests on a gessoed panel. The gesso fills were thus given a coat of cadmium yellow paint to mimic the colour of the gold leaf before multiple layers of green paint were applied on top. At the end, the filled areas were given a glossy protective coating to match the appearance of the original japanning. The result was a conserved object where the remaining original japanning was protected, and the new fills provided an increased visual coherence for the decorative surface. Further, on close inspection the filled areas are easily distinguishable from original material as the motifs of gold shamrocks were not replicated on the new fills. Initial layer of cadmium yellow on the gesso fills. Adding the final touches with a glossy coating. It was a great project to work on with Michael, who has such extensive experience in treating japanned harps. 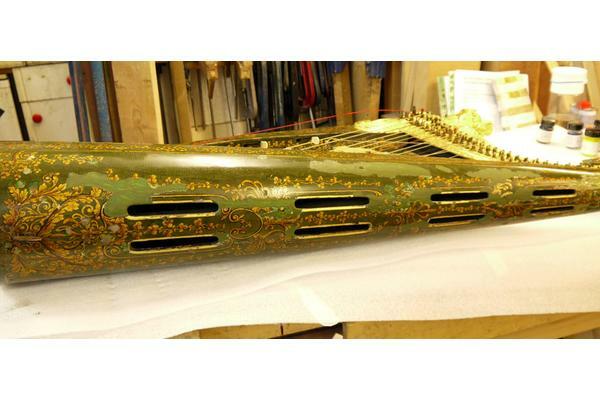 Not only did I learn a lot about both the conservation of gilding and japanning, but it was a special privilege to participate in the conservation decision-making and treatment of this rare harp. Michael Parfett with the harp during treatment. 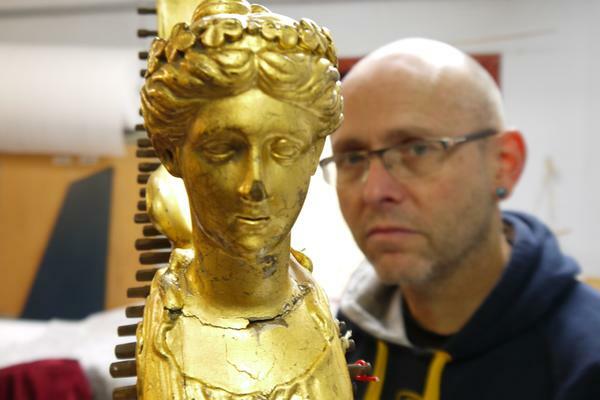 The gilded winged maiden figurine on top of the column is an emblem for Ireland. 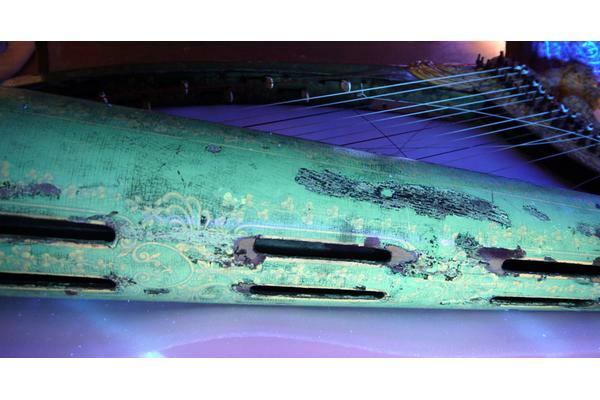 On a final note, enjoy this video of Nancy Hurrell playing on a similar but less lavishly decorated harp by John Egan, which lets us hear what the "Royal Portable Irish Harp" might have sounded like. Brown, W. N., 1913. A Handbook on Japanning: For Ironware, Tinware, Wood, etc. with Sections on Tin-Plating and Galvanizing. Second Edition. London: Scott, Greenwood and Son. Rensch, R., 2004. Trois Siècles de Harpes. Lyon: Western Central.